Semantic Keyword Research & Analysis | Jody Nimetz Co. | Jody Nimetz Co.
Search has changed and the impact of keyword research continues to evolve. Google’s algorithm updates such as Hummingbird have taken steps to creating a more semantically relevant Web. Updates such as these have been developed to better answer those longer-tail queries users are typing in Google. Searchers are more savvy and the need for optimizing for semantically relevant topics and for more conversational queries is the now when it comes to keyword research. The one-to-one relationship between user queries and onsite content is gone. The focus is now on topicality and semantic relevance based on user intent. Keyword research has evolved into understanding what types of queries your users typically use so that you can address their specific questions on your website as part of your content strategy, and gain visibility as a result. Exact match has become less important and optimizing for conversational search has become more important. For example they are typing in full questions. With algorithm updates like Google’s Hummingbird, the Search Engines are becoming smarter, machine learning is the now. Google Rank Brain further illustrates where Search is going. Keywords are still important but it is all about semantics. Keyword Analysis (based on Semantic Intent) is based on identification of semantically relevant topics (and keywords) that your audience is looking for. Including descriptive, relevant keywords in your page copy and meta data is still absolutely essential if you want to be found. People still search for keywords, it’s just that searchers have become more savvy and a one or two search query is often being replaced by a ten to twelve phrase question, or replaced by a voice search. 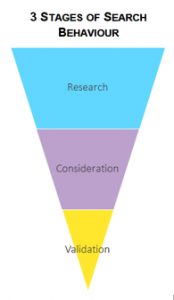 Identification of your user’s search intent at the various stages of their engagement (buying) funnel is critical in being able to intercept your audience as they search for solutions to their questions. There will be different intent as your audience search throughout their engagement process from awareness to research and consideration through to purchase and full on evangelism of your brand. Semantic keyword research allows you to enhance your content based on what terms or questions users may be asking. Identify topic opportunities that your content can be optimized for that will improve the quality of the organic traffic to your website which will assist in improved engagement. Improving engagement on your site by identifying the terms and topics that are relevant to your audience thereby driving time spent and ultimately leads and conversions. Educate machines (search engines) on the topicality of your pages to obtain greater visibility within SERPs. (Greater visibility equated to increased organic traffic to your website). What Will I get as Part of Semantic Keyword Research? Review your existing keyword usage analyzing your existing content to see which terms and topics you are attempting to gain visibility for. Evaluate terms and topics based on user intent to assist in the optimization of your content that will provide a better user experience and build your brand as an authority on the Web. Identify keyword and topic opportunities that will drive additional traffic and engagement on your website. We look at semantically relevant terms by evaluating related searches in the Engines, looking at synonyms and word variations and monitoring what your competitors are optimizing for. We look to identify the topics that your audience is searching for not only today but in the future. Prioritize the terms that you need to focus on by identifying phrases that are within striking distance of gaining visibility in the search engines. Help you gain a better understanding of the topics that you should be focusing content efforts around. When Should You Conduct a Semantic Keyword Topic Assessment? If you are getting ready to launch a new service or product. Prior to a website redesign. After you have launched a new website. During your low season or off-season. If you have not conducted any keyword in more than two years. If you have noticed major traffic declines to your web properties. If you feel that your web property has been hit with a Google or algorithmic penalty. If you simply do not understand how users are coming to your wen properties. If you have noticed that certain competitors have increased their visibility in Search. If you are considered a migrating a website into another. If you feel that your need a keyword refresh, please contact us for a free quote. I have been performing semantic keyword assessments prior to Google’s Hummingbird update and quite frankly a lot longer than that.